Part 3.2 of this series. Biblical piety prays without ceasing. Prayer is not dependent upon anything within the Christian to be heard. It is not a movement of the will, an emotional state of closeness or majesty, or a question of intensity. Too many imagine prayer to be something entirely of their own making, as if the Christian sits down and speaks to God unprompted. But “Likewise the Spirit helps us in our weakness. For we do not know what to pray for as we ought, but the Spirit himself intercedes for us with groanings too deep for words” (Romans 8:26). We would not pray if God Himself did not move our hearts to pray. It is by the Holy Spirit that we cry “Abba! Father!” (Romans 8:15). Prayer is therefore a response to what God has first done. Apart from faith, there can be no prayer, and apart from God, there can be no faith. Yet though we could not pray apart from God, prayer is directed toward God. As Paul says, “do not be anxious about anything, but in everything by prayer and supplication with thanksgiving let your requests be made known to God” (Philippians 4:6). Prayer is therefore the Christian’s work. It has God’s clear command, for Jesus tells us “when you pray,” not “if you pray” in Matthew 6:5. But it also has God’s clear promise, for “your Father knows what you need before you ask Him” (Matthew 6:8). But prayer at bottom is not a matter of words. The Gentiles think they will be heard because of their many words (Matthew 6:7). 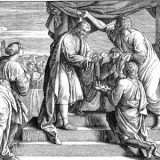 Hannah, however, prayed without uttering a word (1 Samuel 1:13). 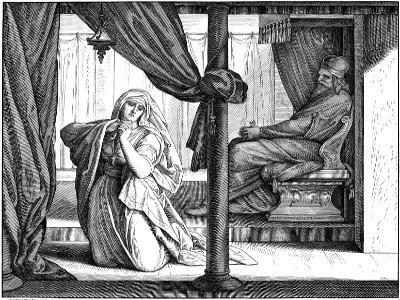 Abraham’s servant prayed in his heart for guidance to Rebekah (Genesis 24:45). As noted above, the Holy Spirit Himself utters wordless groans on our behalf. We should not regard prayer as finding the right words. Rather, prayer is at bottom a recognition of the power of God. “I am the vine; you are the branches. Whoever abides in me and I in him, he it is that bears much fruit, for apart from me you can do nothing” (John 15:5). A prayer of thanksgiving glorifies God for His mighty deeds. “Oh give thanks to the Lord; call upon his name; make known his deeds among the peoples! Sing to him, sing praises to him; tell of all his wondrous works” (Psalm 105:1-2)! A prayer for forgiveness recognizes that the Lord is merciful and abounding in steadfast love. 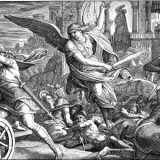 “But the tax collector, standing far off, would not even lift up his eyes to heaven, but beat his breast, saying, ‘God, be merciful to me, a sinner’” (Luke 18:13)! A prayer which makes requests of God confesses that all things come from His hand. “If you then, who are evil, know how to give good gifts to your children, how much more will your Father who is in heaven give good things to those who ask him” (Matthew 7:11)! A prayer of intercession recalls the promises and the mercies of God, even in the face of His wrath. Therefore, “pray without ceasing” (1 Thessalonians 5:17; see also Luke 18:1). Prayer is not limited to particular circumstances, because we are completely dependent upon God for all things at all times. As Paul says, “I desire then that in every place the men should pray, lifting holy hands without anger or quarreling” (1 Timothy 2:8). Limiting prayer only to specific times or specific forms runs the great risk of treating it as a chore. This does not mean that specific times or specific prayers are evil. Such things are highly helpful for a living piety. It is when we regard prayer as a list of words that need to be rattled off before bed or at a prayer service that we act like Gentiles. We are approaching the Creator of all things, who delights to hear our prayers. Who would not want to come, knowing that God Himself promises to hear us? We will discuss practical questions, including difficulties in prayer, in the next installment. But let us not forget that God calls us to this holy work through His Holy Spirit. If nothing else, remember that our Father delights to hear the prayers of His children, and knowing that it pleases Him is in itself reason enough. “Continue steadfastly in prayer, being watchful in it with thanksgiving” (Colossians 4:2), knowing that God will not fail to hear.